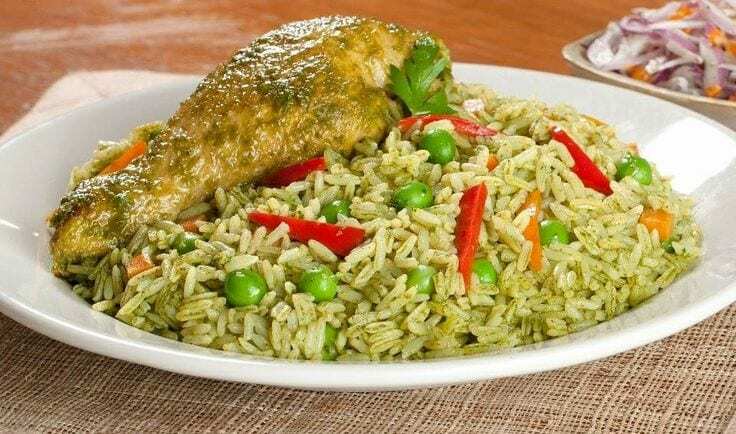 Have you ever wondered how to make peruvian chicken with rice? Here our outstanding chef from Mexico, delivers a Recipe that will give you wings. Making peruvian chicken is easy, but to actually get it to taste outstanding is important. Our How To Make Peruvian Chicken guide is made in such way that we want you to succeed with this dish. Follow this recipe below. There is no other out there! This is the one and it takes you step by step to perfection. In a blender, blend coriander along with spinach and water to make a smooth paste. Reservation. Chicken dry with paper towels and season with salt and pepper. In a saucepan over medium heat oil is heated and fry chicken until golden brown on both sides, about 7 minutes. Remove from the pot and place it on a plate. In the same pan fry the onion, garlic and aji amarillo paste, stirring for 5 minutes. Stir in cilantro and spinach smoothie, fry for 3 minutes. Add the beer, chicken broth, and add the chicken in the pot. Boil, cover and reduce heat. Bake for 20 minutes. Correct the seasoning with more salt and pepper if necessary. In another pan heat 1 tablespoon of oil. Stir in rice and stir well. Add the alverjitas, carrots, peppers, corn, and 3 1/2 cups of broth used for cooking chicken. Let a boil, cover, lower the heat to low and cook for 20 to 25 minutes. Stir with a fork and recapping. When the rice is ready, serve on four plates, putting up a chicken leg and Creole sauce alongside. If you also want a bit of juguito in which the chicken was cooked. To make the Salsa Criolla, 1/2 red onion cut in very thin slices lengthwise, washed well and drain. Mix with 1/2 tomato cut into thin strips, coriander leaves, salt, pepper, juice of 1 lemon and 1 tablespoon of olive oil. If you wish you can add pepper strips. So. With this step by step guide into How To Make Peruvian Chicken. We really hope that you will succeed. If you have any comments. Send us an note to post at distrita dot com.